Not in the security and alarm business? See other use cases. As a security company, customer retention is the name of the game. No matter how many new systems you set up, it’s the revenue generated by recurring monthly services that really pays the bills. If you’re not already doing monthly monitoring as part of your business, ChargeOver’s billing software can help you establish lucrative new revenue streams. If you already offer recurring services, ChargeOver provides a better way to ensure consistent, dependable bill collection. The most successful businesses in the security & alarm industry have one thing in common: recurring monthly revenue. According to an article in Security Sales and Integration Magazine, the best way to grow your revenue as a security & alarm company is by diversifying your recurring revenue streams. By bringing a diverse array of recurring monthly revenue (RMR) services into your business, you can simultaneously increase overall revenue and make your revenue more consistent. 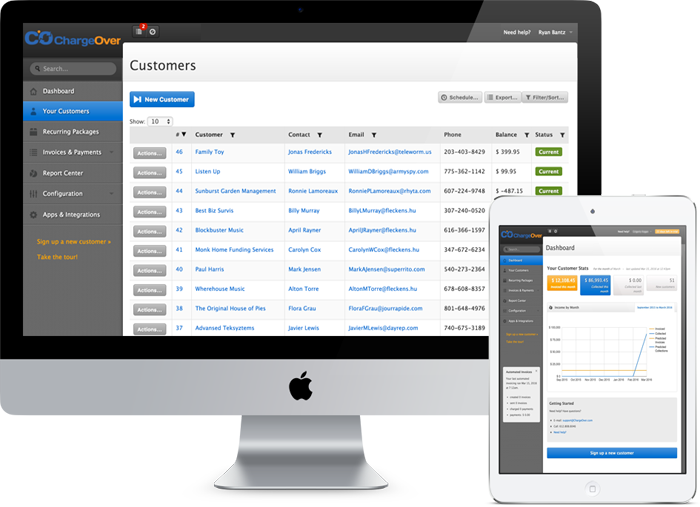 With ChargeOver, it’s never been easier to establish recurring monthly revenue (RMR). ChargeOver is an automated invoicing service that makes recurring billing easier than ever. You can set up monthly contracts for an unlimited number of customers and get paid instantly at the end of every month. ChargeOver automates the process of invoicing, so you’ll never have to chase after a client payment again. As a result, you know exactly how much each contract pays per month, instead of wondering how many contracts you will close. Many security & alarm companies already have some type of recurring service offering. What ChargeOver provides is the ability to automate recurring revenue. With ChargeOver, you can set up contracts in a matter of minutes using an intuitive customer management interface. From then on, monthly payments are taken out on a set schedule, with financial information automatically downloaded to your accounting software. 1. Get paid on time, every time. ChargeOver automates your entire billing process. At the end of every month (or any other defined payment term), the client’s payment method is charged automatically, eliminating the need to chase after bill payments. 2. Build stable, recurring revenue streams. Recurring monthly revenue (RMR) is a major revenue booster in the security and alarm industry. RMR increases client retention, boosts value-per-customer and makes revenue more predictable. With its automated recurring bill payment system, ChargeOver lets you build recurring revenue like never before. Whether you want to offer a monitoring service, video monitoring, recurring repairs, or any other business model, ChargeOver lets you set up a contract and start accepting monthly payments instantly. 3. Save time on data entry and invoice creation. ChargeOver generates financial documentation the minute an invoice is paid, and downloads it to your accounting software. Instead of spending hours creating invoices and entering payment data into spreadsheets, you can let ChargeOver handle it, saving you time and money. 4. Offer flexible payment options. ChargeOver offers one-time billing options as well as recurring. So for clients who aren’t yet on a monthly plan, you can still enjoy streamlined invoicing and automated financial reporting with ChargeOver’s easy, intuitive interface. We’ve made it easy to get started with ChargeOver. There are no contracts to sign, no up-front payments, and no obligations. Simply create your ChargeOver account, and start building recurring revenue in minutes. Also, your first 14 days with ChargeOver for free. This gives you the opportunity to test-drive ChargeOver’s features and see what they can do before you pay anything. Create your ChargeOver account instantly. 1. Create a ChargeOver account in just a few minutes. 2. Customize your client payment plans. Create as many plans as you wish, with options such as tax rates, discounts, payment terms and more. 3. Add or update customers, use the easy import tool or the hosted (and custom-branded) signup form. Once a client is added, you can set up a retainer for them instantly. 4. When it’s time for a payment, ChargeOver generates the invoice and charges the client account instantly.